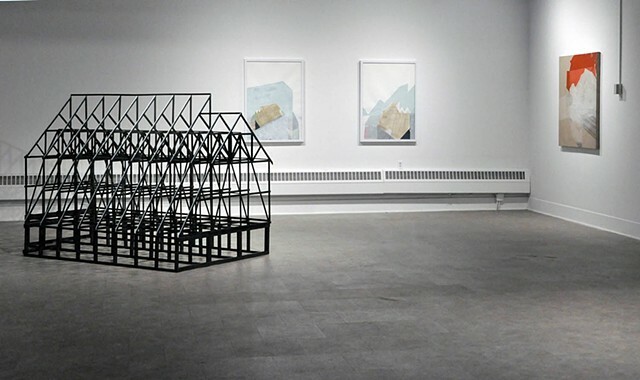 Andy Curlowe’s work on display in Hypothetical Constructs departs from his previous work; paintings and sculptures, which explore the juxtaposition and cyclical interweaving of human influence and the natural world. These new works focus on the development of a specific hypothetical architectural icon in order to explore a more personal construct in his newest series. Adrian Michigan holds a claim to the origin story of the chain link fence, an iconic invention of industrialism. This fencing, composed of woven steel, is staked in sheets to create a barrier for goods and property. For Curlowe’s work and this series, simple chain link fencing holds powerful implications. The fence is a barrier, not of opaque brick but of airy yet robust division. Through these weavings, one could see in and through- forming a transparent barrier. Intrigued by this concept, Curlowe began to explore the idea of transparent barriers and similarly, skeletal structures. 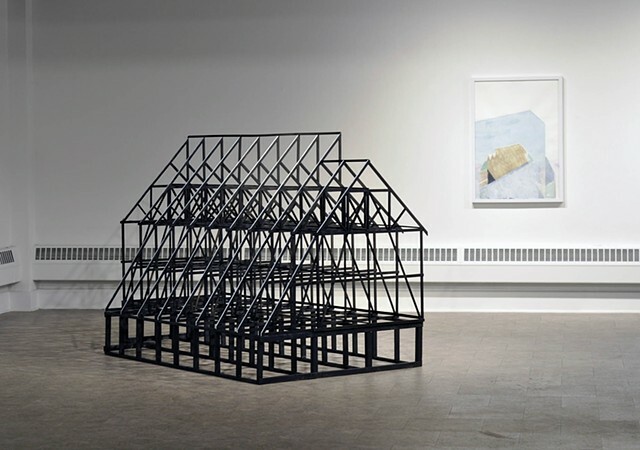 Dividing his studio time between Cleveland, Ohio and rural Vermont, Curlowe reflected upon these concepts of delicate strength, construction and the intricate visual display of architectural breakdown as seen often in both neglected parts of the rustbelt and rural agricultural communities. In an area once filled with vessels of industry, vestiges of Cleveland’s industrial landscape live on in a deteriorating and evolving landscape. Some as reinvented identities, while others crumble; exposing their skeletal structures of steel. These bones expose the strength of the frame and support works of enormous warehouses and factories made obsolete decades prior. After years of neglect and decay, these buildings’ glass windows, wooden roofs and organic fixtures are shattered and reduced. Left behind are dramatic frames, outlines and portals of steel and concrete; frameworks of columns and trusses. Fascinated with this reduction to essence, Curlowe explored this visual engineering within Hypothetical Constructs. While working in rural Vermont, Curlowe became more and more versed in the physical and visual properties of post and beam framework architecture common in cabins and barns there. 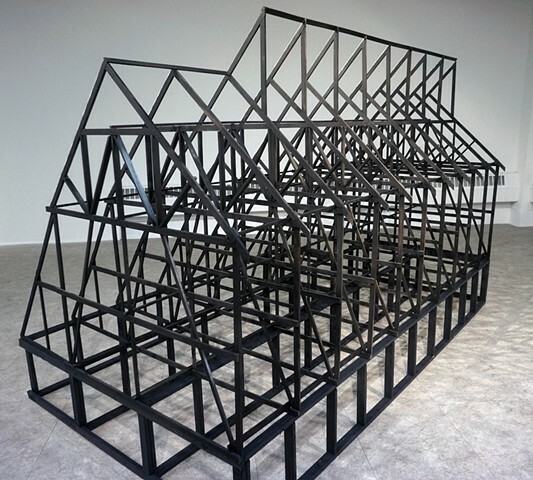 In his sculpture and works on paper, Curlowe attempts to merge the familiar working knowledge of the post beam frames of Vermont with the industrial decay and warehouse iconography of the rust belt. 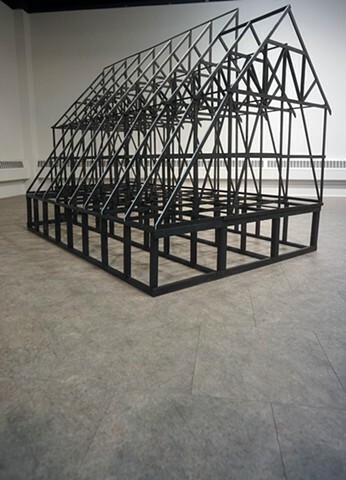 Playing off Cleveland’s factory and warehouses saw tooth roof profile and the truss supports systems seen in Vermont, the Hypothetical Construct sculpture is the artist bridge between these worlds. Within these drawings, Curlowe does not attempt to represent one thing but instead a layered multitude of industry, method, decay and the fleeting attempts at opacity. This works on paper are explored and sought, once found they are repeated with vigor. The artist hopes they are both simple and legible in their complexity of repetition; that they are stoic, strong yet complicated. As our ever timeless, ever changing landscape always will be.